Dallas Center Iowa is located in Dallas county just 20 miles from the greater Des Moines Area along Highway 44. Founded in 1869 it was named for vice president George M Dallas. Learn more about Dallas Center. 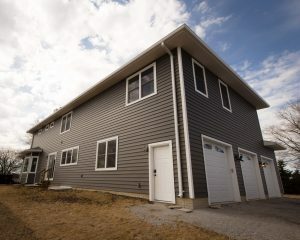 Dallas Center is the location where Compassion Builders had the opportunity to build their first complete custom home. The above photo shows the rear and side exterior of this 3,600-square foot custom home. This farmhouse style home features 4 bedrooms, 2 full baths, a Jack and Jill bath and a ½ bath. The three car garage features 3 individual doors that are 8-foot-tall to accommodate larger vehicles. 2×6 exterior wall construction topped with 5/8 CDX plywood and foam backed siding means this home will withstand the stronger winds common in open farmland areas compared to normal construction. Geothermal heat and a wood burning fireplace keeps the heating costs low. The master bath shown in the above photo shows a solution we provided for these clients. 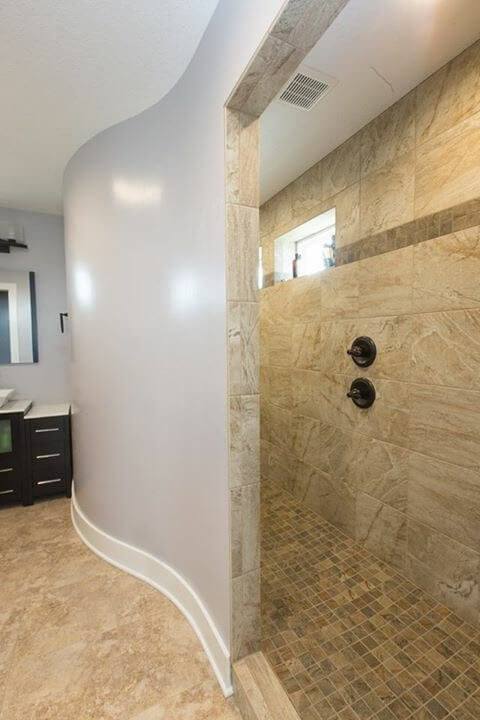 After the home was framed up, they realized the shower was much smaller than they wanted. The problem was how to make it bigger without taking space from the hallway or relocating the toilet. We decided to remove the linen closet extending the shower and to curve the wall to create flow into the bathroom. This eliminated the need for a door or curtain and provided a great detail. If your looking to build a custom home, basement finish or remodel in Dallas Center let Compassion Builders become your contractor of choice. Jonathan and his team went above and beyond building my dream home! Their attention to detail is bar none!! Would highly highly recommend!!! !